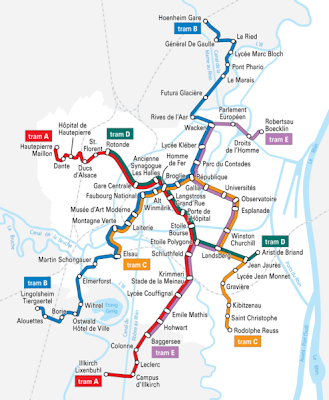 France has always been in the forefront in developing public transportation. I remember my first encounters with the slick TGV - train grad vitesse in Paris more than two decades ago. Trains that operate over long distances in close to 300 km pr. hour. When I arrived in Strasbourg, a rather small city in France, I was very pleased to see that the city had invested in new, ultra modern trams to travel along five different lines. I remember the impression the slick aerodynamically shaped trains made on a college student from an underdeveloped country visiting France for the first time. Since then, more countries have discovered the benefits of good high-speed train services. 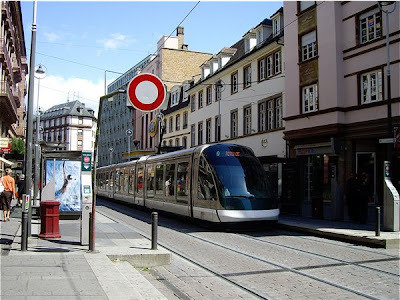 Strasbourg has had tram lines for over 125 years. The first were actually drawn by horses. The trams in present Strasbourg are elegant mini TGV trains, or they at least look like them. They travel along five lines covering 55 km of rails. They are very comfortable to travel with, and easily accessible for disabled. One line goes up to the Orangerie, the Headquarters of the Council of Europe and the European Court of Human rights and the European Parliament. I did not know that SNCF had extended the network of TGV (Train Grand Vitesse) to Strasbourg. An alternative to the bus ride from Frankfurt is to fly to Paris Charles de Gaulle Airport, jump on to a train from the airport and after a smooth 2 hour ride arrive in Strasbourg. This is certainly something I will consider when visiting Strasbourg in 2009.